That’s exactly what Tonkin sets out to do, and you’d have to be a very critical reader to deny that his end product introduces us to a collection of excellent works. The introduction also sets out a few ground rules for his choices. Tonkin has limited himself to works originally published between 1600 and 2000, meaning there’s no place for (or even a mention of) The Tale of Genji, and anyone hoping for the inclusion of anything by Karl Ove Knausgard or Elena Ferrante will be equally disappointed. Another restriction, a sensible one, is a limit of one title per author, preventing certain prolific giants of world literature from taking up too much of the limelight. Tonkin then gets to the main business of examining the hundred chosen titles in chronological order, and that goes exactly as you’d imagine. Starting with Don Quixote, the writer spends a few pages on each of his chosen works, briefly summarising the plot and analysing just what it is that makes the book worthy of inclusion. If that sounds very much like what I’m doing here, you’d be right. In truth, with the entries coming in at just over 1000 words each, the book is rather reminiscent of a collection of (well-crafted) blog posts, and like any blogger, Tonkin has his own style and idiosyncrasies, including a penchant for flowery description and generous dollops of praise for his selections. Of course, it’s really all about the books Tonkin chooses, and he has certainly come up with a wonderful collection. For many readers, part of the fun is coming across old friends. As I perused the entries on novels such as War and Peace, Petersburg or Hopscotch, the summaries helped bring the hazy memories of the plots into focus, reminding me of how much I enjoyed reading them (one pitfall of this book is the way it makes you want to reread everything immediately…). The collection also provides handy reminders of books I’ve long wanted to read, but never quite got around to, such as Knut Hamsen’s Hunger or Naguib Mahfouz’s The Cairo Trilogy, again, guaranteed to disrupt any carefully designed reading plan. Perhaps most interesting, though, are the books that weren’t really on my radar before stumbling across them, such as Jens Peter Jacobsen’s Niels Lyhne or George Sand’s Indiana. While not all of the choices immediately grabbed me, there are certainly many titles here that went straight onto my wishlist. Where there have been multiple English-language versions of a book, he often briefly compares the two for style (the cynic in me wonders how much time he really had to compare the various versions). 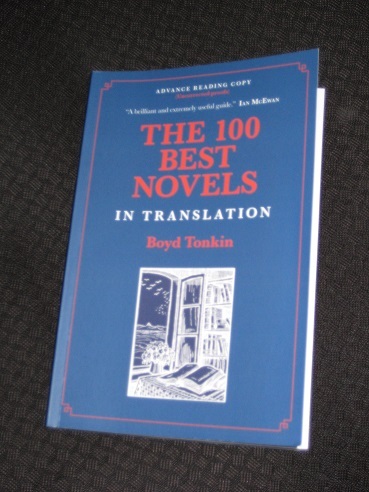 There’s a lot to like about The 100 Best Novels in Translation, but, of course, it’s not perfect. This certainly isn’t a work to race through (imagine reading a century of blog posts, one after the other), and there are times when the plot summaries, welcome as they are, give far too much away for anyone planning to read the book in the near future. In addition, the scope isn’t quite as wide as it may first appear. The four-hundred year range is deceptive, with only twenty-six pre-twentieth-century choices, and despite a handful of Japanese selections and a few from South America, on the whole it is rather Eurocentric (France and Russia are Tonkin’s main go-to countries). Naturally, though, it’s the gender issue that has attracted most interest in other reviews, with only around fifteen of the hundred books selected written by women. There are many great inclusions among these, such as works from Christa Wolf, Clarice Lispector and Tove Jansson, and a surprising number of the books by male writers (such as Alexandros Papadiamantis’ The Murdress) appear to focus on the plight of women in a patriarchal society. One hundred is a fairly small number to cap the whole of world literature at, so it’s unsurprising that Tonkin has gone for many of the great white (male) hopes of the literary world, but for many readers, whatever the rationale, this will be a black mark against the book. Sounds interesting, if flawed and definitely bad for the TBR. And definitely surprising about so few pre 20th century titles – a black mark in my book! C runch question – how many German works are included, Tony? Great! I’ll try to guess what they are before getting myself a copy …. It’s difficult to judge anyone’s choices until proportions are compared to what is actually available in translation. Around a quarter from outside Europe may seem disproportionate but I suspect it at least represents what is translated – similarly with women writers,particularly pre-2000. My test would be does it give someone who reads a lot of translated literature some new ideas – and the answer seems to be yes! (I also suspect it has more books from outside Europe than the equivalent English literature collection had from outside England). Grant – The issue is that many people won’t accept anything less than a 50-50 split. No matter how much effort Boyd put in to his rather subjective list, there’ll always be people questioning it. I do my best to read books by female writers, and I’m sure that if I did a similar list, my gender balance would be way off too (but there’d be a lot more books from Japan and Korea on it! ).